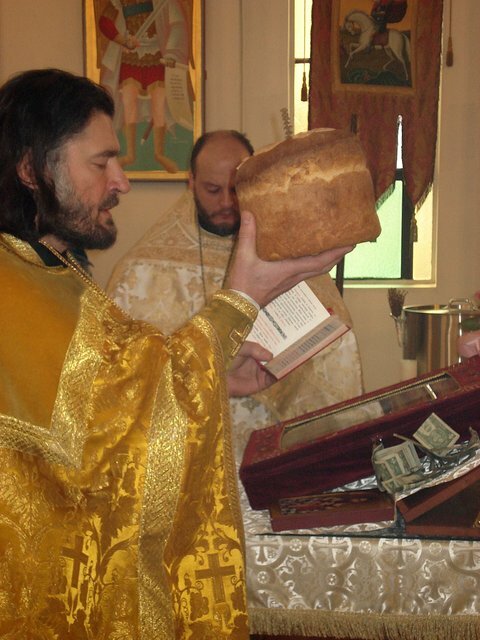 Elizabeth, NJ - On Sunday 25th January after the Divine Liturgy, our parish priest Reverend Father Zoran Radovic cut the kolach and blessed the zhito in the church hall. This year the kum was Mr Predrag Dragovic with his wife Jelena and children Mia and Mateja. Afterwards the children of our parish recited poems about St Sava. All the children gathered in the church hall were given presents provided by the kumovi. The folklore group performed the Serbian dances. 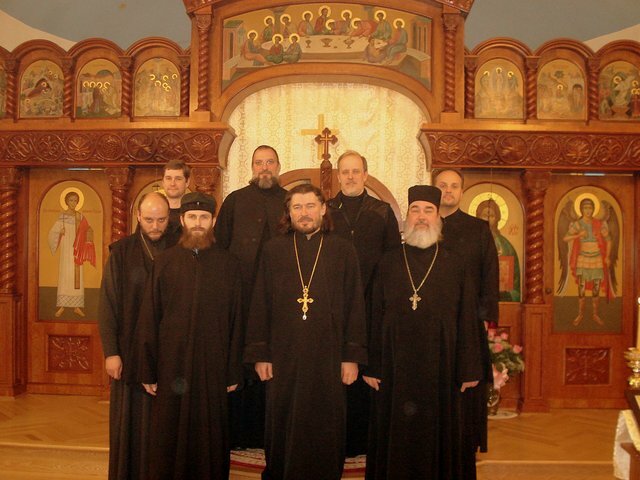 On the very day of the feast of the first Serbian Archbishop, enlightener and father of our nation, with the Archpastoral blessing of His Grace Bishop Dr MITROPHAN, Father Zoran invited priests and deacons of the Russian Orthodox Church to serve with him. 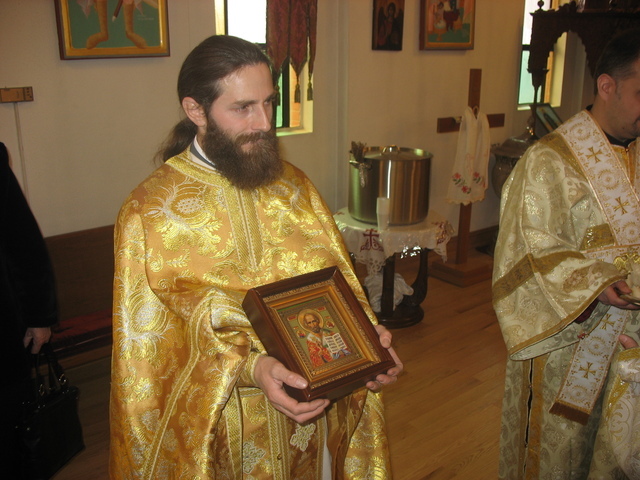 Very Reverend Protopresbyter Liubo Milosevic, rector of the Holy Trinity Russian Orthodox Church in Vineland, NJ was the senior officiating priest at the Divine Liturgy. 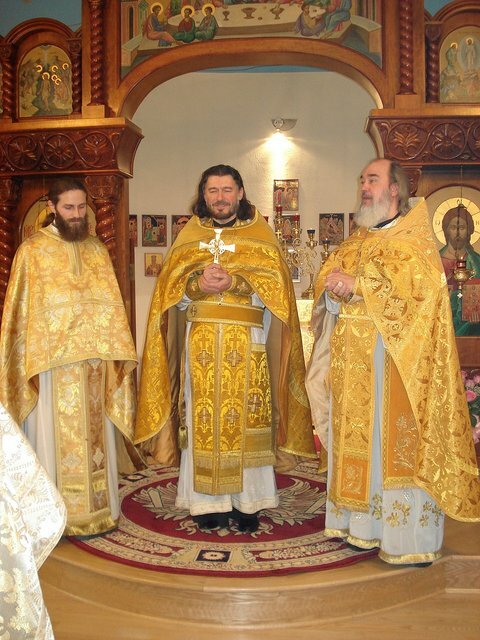 Very Reverend Archpriest Serge Lukianov, rector of St Nicholas Russian Orthodox Church in Red Bank, NJ, Very Reverend Protopresbyter Seraphim Gan, rector of St Seraphim Russian Orthodox Church in Sea Cliff, NJ, Protodeacon Pavel Wolkow and Reverend Deacon Leonid Roschko served as well. We were blessed to have the miraculous myrrh-streaming icon of St Anna from Philadelphia for the third time since last year. Nikolai Kostur, seminary graduate, sang the responses. 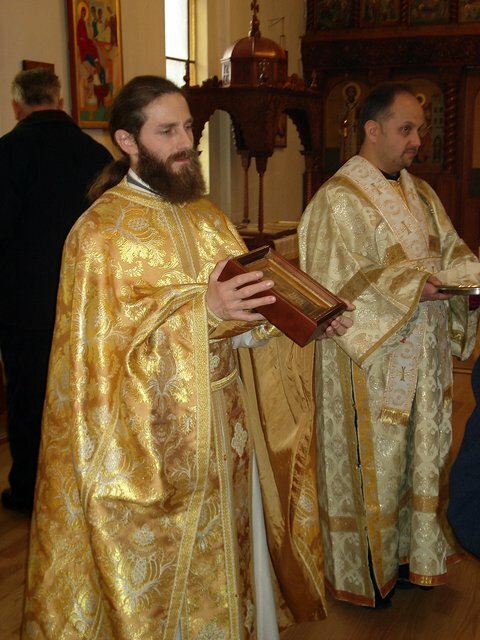 Sub-deacon from the Russian Church of Our Lady in Philadelphia and readers Nektary Lukianov and Branko Zec assisted during the Divine Liturgy. Those faithful who had decided to come, some of them taking a day off work, did not regret it. The atmosphere was very festive and prayerful. 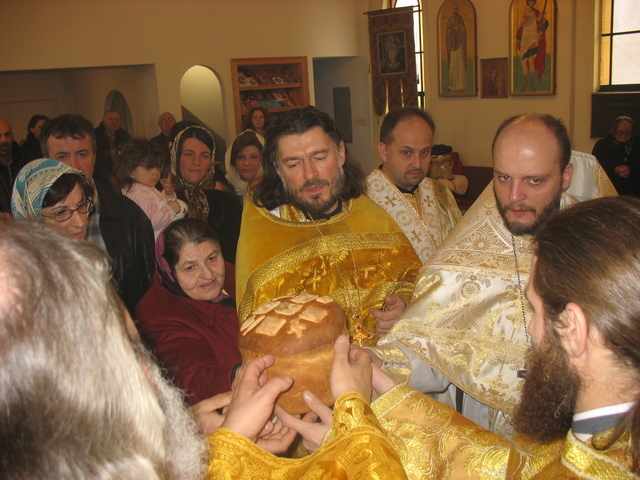 The kolach was cut and zhito blessed at church. 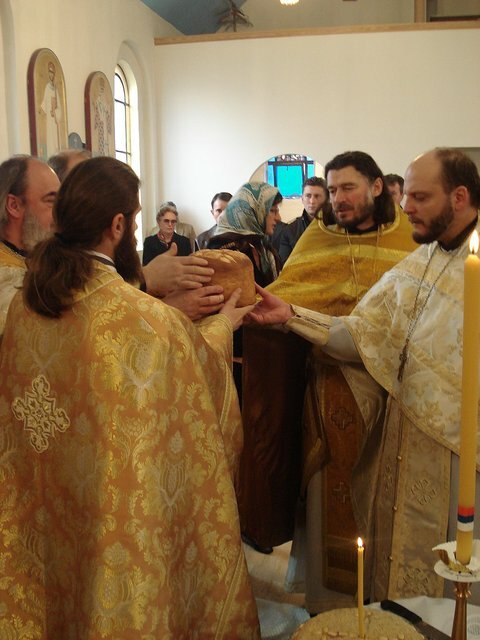 For some of our visiting clergy this was the first time to participate in this rite. 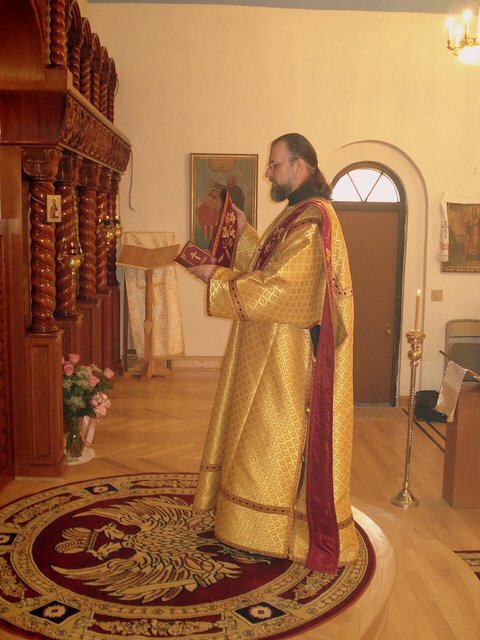 Father Zoran then read prayers to St Sava and Holy and Righteous Joachim and Anna. 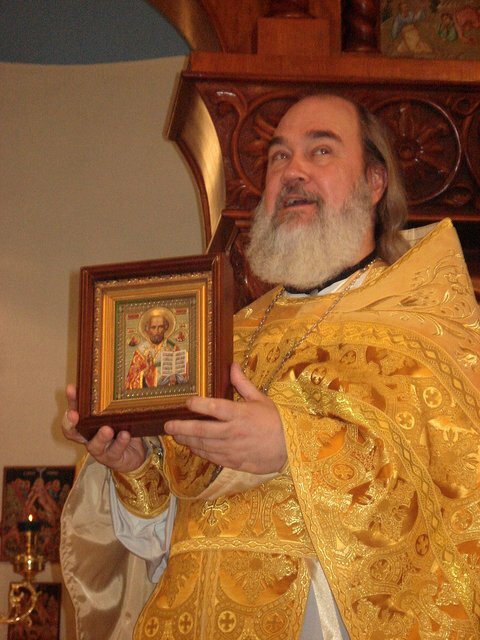 In the name of the clergy from St Nicholas Church in Red Bank, NJ, Father Serge presented Father Zoran with an icon of St Nicholas. Upon the completion of the Divine Liturgy, the clergy took the icon of St Anna to the church hall where it was greeted by the faithful. A lunch was served. This was a great blessing for our parish and another step forward along its way towards the spiritual renewal.